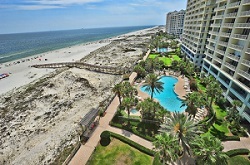 The Beach Club condo, beach resort home in Gulf Shores Alabama. Beach Club is situated on the Fort Morgan Peninsula in Gulf Shores Alabama; this Resort & Spa beach complex spans over 86 acres of private beach. The Beach Club rests on the shores of the Gulf of Mexico with the Bon Secour Bay to the north. The Beach Club has an abundance of outdoor activities and resort-style amenities, making it the ideal family vacation destination.